The BJP claims that the rallies in Gadchiroli and Chandrapur districts of Maharashtra were cancelled due to "technical reasons". 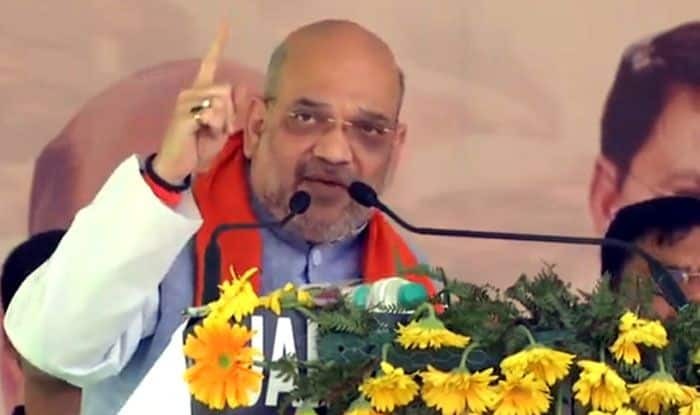 The NCP on Monday claimed that BJP chief Amit Shah cancelled his poll rallies in Gadchiroli and Chandrapur districts of Maharashtra on Sunday as people did not turn up for the public meetings. The BJP dismissed the claim, saying Shah’s rallies were cancelled due to “technical reasons”. Union minister Hansraj Ahir and BJP MP Ashok Nete are seeking re-election as BJP nominees from Chandrapur and Gadchiroli-Chimur Lok Sabha seats respectively, which will go to polls on April 11. “Amit Shah’s two public meetings in Gadchiroli and Chandrapur were cancelled. The airplane is an excuse, the real reason is people had not turned up,” NCP national spokesperson Nawab Malik tweeted with the hashtag “23 May, BJP gone”. Maharashtra BJP spokesperson Keshav Upadhye said Shah’s rallies were cancelled “due to technical reasons only”. “Unlike the NCP’s public meetings, BJP’s rallies always receive a big response,” he said. Lok Sabha elections to 48 seats in Maharashtra will be held in four phases on April 11, 18, 23 and 29, and the results will be declared on May 23.